See our recent related post on the selection of NZ and Australia for trialing GM insects, all part of the NZ Gov’s pest eradication program called Predator Free 2050. 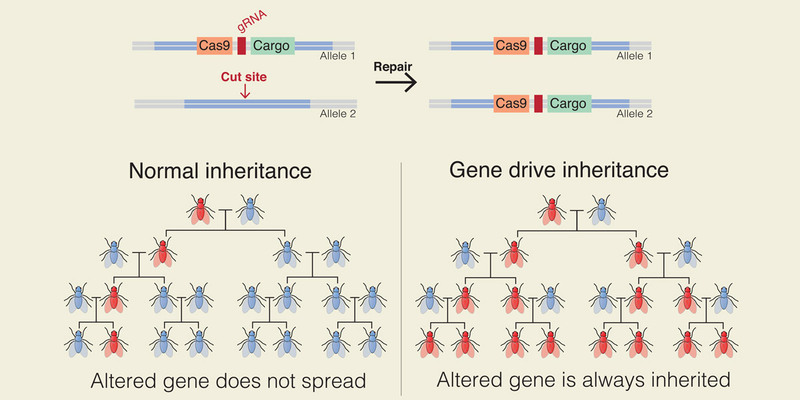 Research has found that gene drive technology has many problems; immune systems in wild populations could override the sterility gene after a few generations. With no control over the ability of the genetic technology to be contained there are risks that sterility could spread to other countries. There is the potential that, as TB spreads, so could the sterility technology, which could severely affect farmers who have livestock. The only gene drive technology that has been developed is in mosquitoes. Promoters nevertheless continue to hype unrealistic promises about gene drive applications to the public. The New Zealand Herald reported that Minister Sage “elbowed out” the gene drive project. That project was looking at New Zealand islands to introduce sterile genetically modified small mammals like mice and rats to see if they were able to breed. GE animal experiments at AgResearch refute promises of animal genetic engineering that have produced disasters for animal welfare. These experiments show the need for much more caution before allowing genetically engineered organisms outside containment. “New Zealanders were softened up by promises of medical benefits. GE animals were funded instead of a focus on research funding for issues that farmers are desperate to address. AgResearch annual reports reveal data on animal euthanasia and deformity,” said Claire Bleakley, president of GE Free NZ. The original experiment on transgenic cows that expressed the human gene Myelin Basic Protein for Multiple Sclerosis has ended with the last cow being euthanised due to chronic lameness from hip problems that did not respond to treatment. “This disastrous experiment in genetic engineering of animals must be a warning against ignoring and underplaying the risks when gene drive experiments are being discussed,” said Claire Bleakley. This NZ Herald article, as is common with mainstream media material, likely flew under the radar on 4th December. Judging by the disbelief from the public at our recent posts on this topic, it clearly didn’t get noticed. The article is basically an expanded version of the last one on topic here, and straight from the horse’s mouth so to speak. It is coaxing you into the up sides of GE. GE Free NZ however has now issued a warning about gene drive tech, that post is coming tomorrow. Read our previous posts on topic over the past week (in archives for December 2017, left column of News page, or search GMO in categories also to the left). Particularly also, search the GE Free NZ site for further info on the GE topic. GE is being sold to the NZ public as good for our health and environment among other things while the down sides are quickly dismissed, swept under the carpet or downplayed by media. As GE Free NZ points out, these GM animals end up euthanised with all kinds of health problems. We need to proceed (if at all) with extreme caution. Why ever does man think he can improve on nature? “Overseas researchers interested in pest control or eradication are all looking at New Zealand,” says Forest & Bird chief executive Kevin Hague. ‘When Kiwi rat killing expert Doctor James Russell was told his research was being sized up for United States military funding, he wasn’t surprised. “The US military – they have very long fingers. Even through the universities in New Zealand, they have a representative that comes around and just asks, ‘hey, what are you guys up to’. “And obviously we’re in the business of eradicating entire populations of animals from an island and so they have cocked their ear towards me once or twice. Also being evaluated were remote islands around New Zealand, sized up for live trials of genetically modified rodents. The interest in Russell and New Zealand emerged during an investigation into the activities of a multi-national science advocacy and gene drive research body called Gbird. It has a US$6.5m slice of that Darpa money and has been considering how to spend that in New Zealand. The detail was revealed in a database of emails and documents charting Gbird’s growing focus on New Zealand – and the involvement of a taxpayer-owned Crown Research Institute which told the consortium it would make gene drive research a focus of “NZ Inc”. It shows how the rise of the predator-free movement has intersected neatly with the bold new frontier of gene drive technology. The database of more than 2000 documents released by North Carolina State University (NCSU) reveal Gbird’s interest in New Zealand as a possible test site and its efforts to get alongside those leading our fight against predators. ​The documents show careful efforts by Gbird – Genetic Biocontrol of Invasive Rodents – to shape its image and manage possible fallout associated with the US$6.5m pool of Darpa cash. Among the documents is the report of the meeting with Russell’s meeting in mid-2017 with Gbird’s co-ordinator Royden Saah. After the meeting, Saah reported to Gbird members: “Co-ordinating with James Russell. Appears no NZ islands meet the strict criteria used within Darpa grant. First it’s important to understand where New Zealand sits in the world of pest eradication. Our national goal of wiping out possums, rats and stoats roughly sits with the research focus of leading thinkers on gene drive technology. That’s because it’s not just about being able to create new technology but what you do with it. And in a world of potential – agricultural or medical benefits – conservation has become a core area of interest to gene drive researchers. Gene drive technology appeared to offer definite answers to those seeking to eradicate predators. It also offered a permissive, public-friendly area in which to explore new technology. A critical aspect of new technology is the willingness of society to allow new frontiers to be explored. US military money has come with researchers wanting to kill Kiwi rats using gene tech. Australia and New Zealand to be test sites for GM insect trials courtesy of DARPA! I’ve heard a few nay sayers on the authenticity of this claim which set me to reading more of the links and particularly the synbiowatch site. It does indeed appear that discussions are ongoing with this. I was not aware that the gene drive proposal was all over the media during this year 2017 & prior (been a busy year). Have a search & you will see, preferably a non google search, you will find more. There’s indeed been a media drive to capture public ‘consent’ sugar coated with all the pluses. I will add some of those links but really it deserves another whole post. Then I see on some of their conference papers, ads etc. (synbiowatch) the familiar names Monsanto, DuPont, Rockefeller Bill & Melinda Gates and more. Those names alone are cause for caution. The emphasis on the drive seems more on animals at this point although the trials for insects have (?) been in Hawaii & are proposed (?) for Africa. I’m sure I saw reference to release of GM insects in Christchurch this year but cannot find a link anywhere. Could be wrong on that, unfortunately I didn’t keep the link. Overall anyway, it is tied in very much with NZ’s predator free 2050 plan basically. So that’s government & will Jacinda oppose it? I doubt it personally as she is globalist isn’t she? Even if she did personally oppose it I doubt she would be able to reverse this tide. Interesting timing wasn’t it? Right on the year of election & we know who was steering the ship prior to that. I’ve ceased to be amazed now at the arrogance of these people to imagine they can improve on the ecosystem. As if it has not survived perfectly well for thousands of years without the help of GM. Seems to me the biggest pestilent threat to the survival of the ecosystem is them. Humankind. The original polluters of the planet. In order to make sense of the title of this posting read down to where it is stated where the proposed test sites for this GM technology will be. No sites in the US obviously. After all, if there are any unexpected consequences of releasing GM altered insects in the environment better do it well away from America – and there’s lots of water between America and the Antipodes. But don’t worry, they are also preparing a PR package aimed to “create government and community acceptance”. The main funder of gene drive technology is the US Defense Advanced Research Projects Agency (DARPA). With virtually unlimited funding imagine what the folks at DARPA can come up with. For the betterment of humanity, as Bill Gates would like us to believe, or for America’s military/corporate complex with global dominance as the real goal? Perhaps this will not be such an easy sell in Australia because virtually all Australians know of the ongoing tragedy of the introduction of cane toads, introduced to Australia from Hawaii in 1935 by the Bureau of Sugar Experiment Stations as an amazing new technique to control the native grey-backed cane beetle. It didn’t work and now the toad is slowly invading much of Northern Australia with great destruction of native species. The coming gene drive PR spin by “Emerging Ag” will claim benefits such as controlling mosquito diseases but other not mentioned “benefits” will be to try to develop a Monsanto pesticide resistant bee which will be used to pollinate crops sprayed with the chemicals without dying. After the GM bee has done its job, it’s programmed “termator gene’ will ensure all the GM bees die without leaving offspring, so each year farmers have to purchase a new batch of GM bees if they want to have pollinating dependent crop. Such a development would go a long way to assure global US military and corporate dominance over the world’s food resources. Search this topic for yourself, there are many more links. Little opposition published there by mainstream except GE Free NZ.